"Three more days til Friday." No coincidence, obviously. Simplistic, raw and emotive was clearly what Rihanna was going for here and it really works. Anything polished or theatrical would look out of place. The whole purpose of a stripped down video is so that more focus can be paid to the lyrics. It was pretty much like watching an oldschool Gap commercial in the form of a music video. 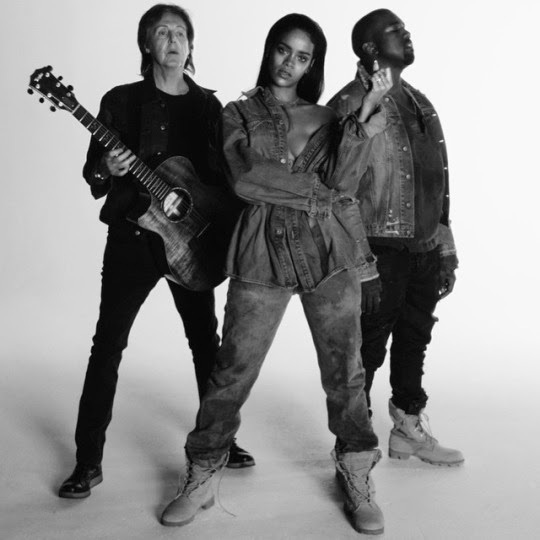 'FourFiveSeconds' is still her most underwhelming lead single to date in my eyes but she actually sold it with this video. I like her look and she looked beautiful. Kanye's dancing made me laugh. This fool was sweating, mean mugging and acting like ants was nibbling away at him inside his pants. You can say he brought the intense aspect to the visuals, which was directed by Inez and Vinoodh. I look forward to watching all three of them performing this at The Grammy Awards, which was officially announced today.